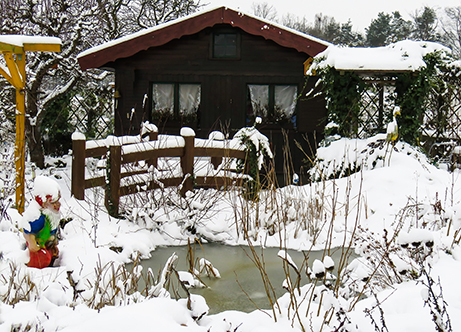 Winter is certainly the time to dream, plan and prepare for next year’s garden, but there are a number of tasks you can do out in the garden to keep it growing well through the winter months. Let’s take a look at ten ways to maintain your green thumb through the coldest time of year. 1. Dream, scheme and plan for next season. Winter is the time of year when we reflect on how our gardens grew and hunt for ideas on what to do differently next year. Look through the garden photos and notes you’ve taken, then make a list of plants that need to be moved, divided or replaced. Search for solutions about how to improve your soil, how to combat the Japanese beetles that turned your roses into swiss cheese, and any other issues that have popped up in the garden. Make a list of the new plants you’d like to try. Once spring hits you’ll want to get out into the garden, so take care of these things now. 2. Pre-order seeds, bulbs and plants for spring. Plant catalogs for gardeners are what the Toys “R” Us catalog is to children. Grab your highlighter and start marking your must-haves for next spring, or go online to pre-order plants, seeds and bulbs. Organize your new orders and the seed packets you have left over from last year so you’ll know exactly what you have to add to the garden in spring. 3. Design a new garden bed, path or feature. You don’t have to be an artist to roughly sketch out a new feature you’d like to add to your garden next season. But if drawing isn’t your thing, try gathering pictures from Pinterest or Houzz that illustrate what you want to accomplish. Maybe you’d like to add a raised bed or portable garden near your patio, or grow a mailbox garden. Now is the time to start looking for a landscape contractor who can help you accomplish these goals. Get on their list now or risk being at the back of the line come spring. 4. Organize your shed or garage. If it’s not too cold where you live, winter can be a great time to haul all of your gardening supplies out and organize them. Clean out the dirt you’ve brought in with your shovels all season and take down all the spiderwebs. Evaluate each item before moving it back in; make a “keep” and “donate or sell” pile and stick to it. Add more shelving and hooks for tools if it will help to keep you more organized. 5. Sharpen and oil your tools. While you have all your tools hauled out of storage, take the time to sharpen and oil your pruners, hedge shears, loppers, shovels, mower blades, and anything else that might require maintenance. Use steel wool to remove the rust from the blades and hinges, and oil them well to prevent future rust from developing. 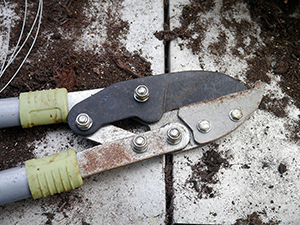 When it’s time to head back out into the garden in spring, you’ll be happy to have nice, sharp tools to work with. 6. Check stored bulbs and tubers for mold and moisture. If you are storing any dormant bulbs or tubers like canna lilies, elephant ears, or tuberous begonias, open the container once per month to make sure no mold has developed and they are staying adequately moist. 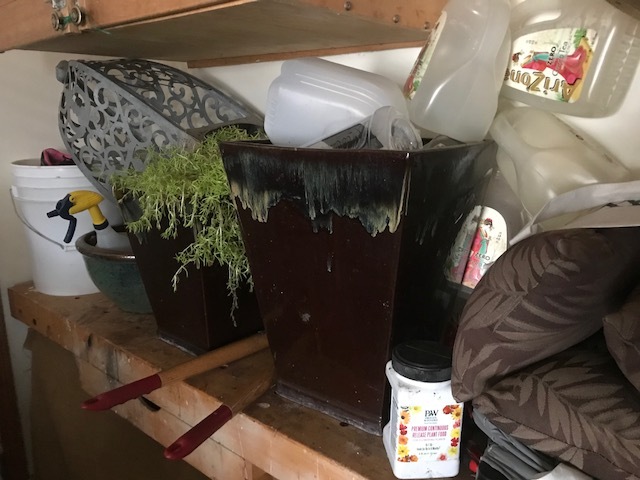 Discard any moldy roots immediately so they don’t affect the others, and mist any desiccated roots with water before returning them to storage. 7. Water any containerized plants you are overwintering outdoors under cover. As with bulbs and tubers, it’s important to keep the roots of any plants you are overwintering in containers outdoors under cover adequately moist. If the soil isn’t frozen, water them lightly or add a layer of snow on top about once per month. Even though the plants are not actively growing, you don’t want their roots to become desiccated to the point where they can no longer absorb moisture and nutrients. 8. Reapply mulch or lay evergreen boughs over sensitive plants in the garden. Newly planted perennials, young broadleaf evergreens like azaleas, or plants that are borderline hardy in your zonebenefit greatly from winter mulch. By insulating the plants’ roots and shielding their foliage from winter winds, you increase the likelihood they will survive the winter and won’t heave out of the ground during freeze/thaw cycles. 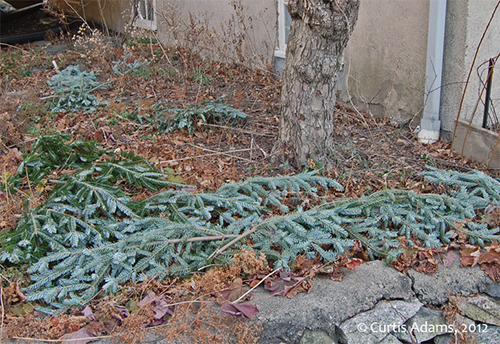 Be sure to remove this winter mulch in early spring so the plants can start to grow again. Photo courtesy of Curtis Adams. 9. Reapply animal repellents, if necessary. Once the leafy green foliage and fall fruits are gone, deer, rabbits and other garden pests turn to woody plants and roots for food. After all, they need to eat in winter too. 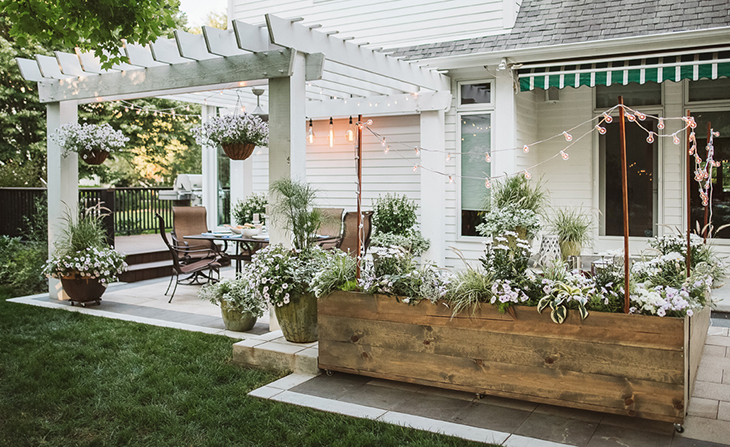 Pay close attention to the bark and base of young trees and low-branched shrubs, and evergreen plants of all kinds, inspecting for signs of damage. Reapply animal repellent to prevent further damage through the winter months. 10. Maintain heated water features and bird baths. If you’ve installed a heater in your pond or bird bath to provide a fresh water source for birds over the winter, keep an eye on it to make sure it isn’t icing over. Heaters are notorious for going out in the coldest months, and you want to keep your prize koi fish safe and the birds hydrated. If ice does form across the pond, gently make a hole or pour hot water over an area to break it up so that oxygen can continue to flow.